Following on from earlier post, Ephemeral I, here is a second image to meet the ephemeral theme. Like the first shot, this image is taken in a house that has not been lived in for around 30 years. Abandoned, desolate and now almost just a shell, this suitcase can be found lying on a bedroom floor. It is as if a lifetime’s possessions can be simply packed up into a trunk, the journey continues. No one will really notice whence we are gone, life moves on. Life is fleeting, take what opportunities you can. The text book definition of ephemeral is “lasting for a very short time”, with such synonyms as “fleeting, transient, passing, short-lived, cursory, temporary, momentary, brief…” . 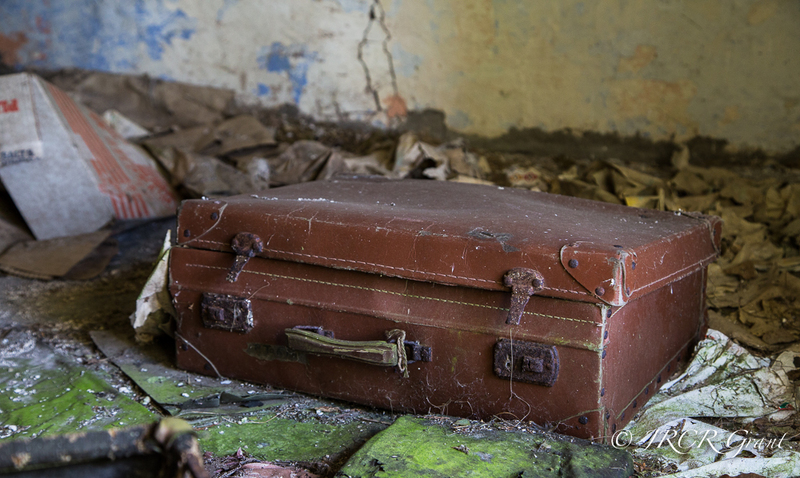 To my mind all of these can be used for our time on this planet and I think this image of a suitcase in a long abandoned house is so appropriate for the theme. Absolutely 😀 I thought you’d like a story! I’m sure it will bring back memories for quite a few of your followers. Thank you Kathryn and I agree wholeheartedly on the abandoned places. So many untold stories…..
Like others I am intrigued by the story behind the objects John. How fleeting our lives really are, fits in so well with the theme. Working on the set from this scene as we speak…. There’s something very poignant about the abandoned suitcase in its derelict setting. Maybe it’s the suggestion of promised travel and escape thwarted. Great evocative photo.